Version 1. Triple tapped pickup. 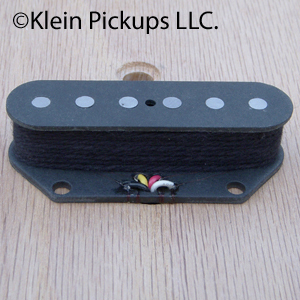 The pickup starts with Large Diameter .197 Alnico 3 flush mount, 42ga Plain Enamel. The first tap is wound with low output Telecaster twang in mind, 4.7k. The 2nd tap shifts to a Fenders 60's output which lies at 6.3k. The 3rd tap winds to 7.9k which is Esquire spec. Version 2. Triple tapped pickup. The pickup starts with Large Diameter .197 Alnico 3 flush mount, 42ga Plain Enamel. The first tap is wound to 5.2k a 50's low wind for the ultimate pure country tone. The second tap lends to a mid 60's output at 6.7k. The third tap winds to 8.3k which is a slightly overwound Esquire and lies closer to a Nocaster bridge output. This pickup is a perfect for all esquires. Wax potted to avoid unwanted microphonics.